Pair of sculptural Danish modern lounge chairs designed by Ib Kofod-Larsen. Sculptural frames fully restored. Seat and backrest newly upholstered in natural mohair. Wingback lounge chair made in Denmark, circa 1950s. Newly upholstered in linen; sculptural teak framing fully restored. Perfect in a bedroom setting, office or library. 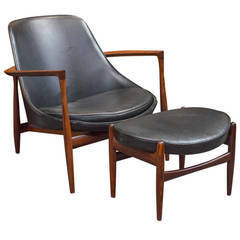 Spectacular pair of lounge chairs original from Denmark, circa 1950s. Walnut frames fully restored. Brass hand polished, new cushions upholstered in taupe linen. Handsome pair of Danish-Modern lounge chairs, newly recovered in olive velvet. Sculptural teak bases fully restored. Danish modern, Ib Kofod-Larsen style lounge chair. Has a teak frame with original upholstery. Nice chair for a Mid-Century Modern interior. Superb original penguin lounge chair is designed by Ib Kofod Larsen. Retains original upholstery and thenoatina is brilliant. Signed ‘Made in Denmark’. Worldwide shipping available. Very rare armchair model Elizabeth designed by Ib Kofod-Larsen. Produced by Christensen & Larsen in Denmark.